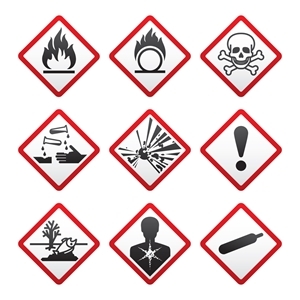 For businesses that are involved in either producing or transporting hazardous chemicals, where do they begin the process of finding the perfect drum labels? Many countries have strict standards for business labels and safety data sheets that depict a products' life cycle and exactly what is inside the container. Not adhering to these standards could hinder an organization's profitability and they could even face fines for not labeling items properly. How do I pick the right drum labels? At DuraFast Label Company, we remain up-to-date on the latest requirements and will ensure that your business stays current. For example, the United States' Occupational Safety and Health Administration (OSHA) created the "Globally Harmonized System of Classification and Labeling of Chemicals" (GHS). Everyone from the personnel involved in distribution to the general public - essentially anyone who could be exposed to a substance - needs to be informed of potential hazards. By using an Epson GP-C831 printer, for example, your business can create its own British Standard (BS) 5609 certified labels. If and when standards change, there will be no downtime while you wait for new ones to come through - you can simply print your own durable labels. Why choose DuraFast Label Company drum labels? Our drum labels are not just durable, they have passed all necessary testing requirements, including a 3-month test in salt water. Any company that needs to transport maritime dangerous goods can rest assured that they will be able to design and print the right marine labels for all products. To start printing your own drum labels that are BS5609 certified immediately, contact one of the specialists at DuraFast Label Company today. An Epson GP-C831 label printer can handle the amount of durable labels that must be created. Your company will never again fall behind on adhering to federal or international label standards. Contact one of our representatives to learn more about the benefits of an Epson GP-C831 label printer today.